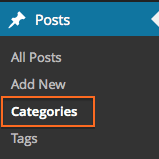 Categories and Tags help you organize your posts. Categories are used to organize your posts by topic. Each post in WordPress is filed under one or more Categories to aid in navigation and to group posts of similar content. Categories may be assigned to a Category Parent so that you can set up a hierarchy within the Category structure. Category Names must be unique even if a Category has two different Parents. Categories Panel – Go to the Admin Panel and select Posts > Categories. In Categories, you can set up categories (parent) and subcategories (child). This panel is also where you manage your categories. 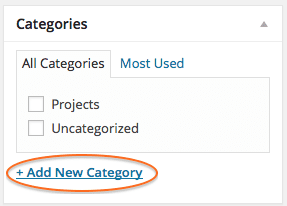 Categories “On the Fly” – Create categories while editing a new or existing post. 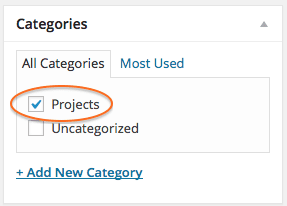 Click the + Add New Category link in the Categories pane. Select a Parent Category. If you want to create a Parent Category while editing a post, save or finish your post, create the parent category in Posts > Categories then go back to your post to assign it to the newly created category. Categories are assigned to posts when you edit a new or existing post in the Categories Panel. You may assign more than one category to a post, but you must have at least one. Once you have created categories for your blog, you may want to assign one of them as the default category and remove Uncategorized. In the Admin Panel, click on Settings > Writing and select a new Default Post Category. To remove categories, such as Uncategorized, go to Posts > Categories and you will now be able to delete the Uncategorized option. Now that it is no longer the default category, it can be removed. Tags offer another way to offer topic information to a post. They are not required but can be used to graphically display the popularity of a topic through the Tag Cloud Widget. Every post in WordPress can be filed under one or more Tags to aid in navigation and to allow posts to be grouped with other posts of similar content. Unlike Categories, posts do not default to Tags and Tags have no hierarchy so there is no Parent → Child relationship. Like Categories, Tag names must be unique. 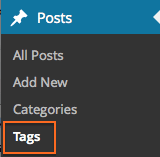 Tags Panel – In the Admin Panel, click on Posts > Tags. If you know how you want to organize your blog, you can go here and set up your tags. You may also manage your Categories from this Panel. 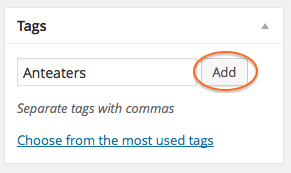 Tags “On the Fly” – Create Tags while editing a new or existing post by clicking Add in the Tags panel. You may also select from existing tags by clicking on Choose from the most used tags.